A bit of a cheat this week, I didn't paint these in 1 evening, more like 3. I was so keen to see how they came out i found some time over the weened and got the majority of the work done and just finished them off and based them tonight. 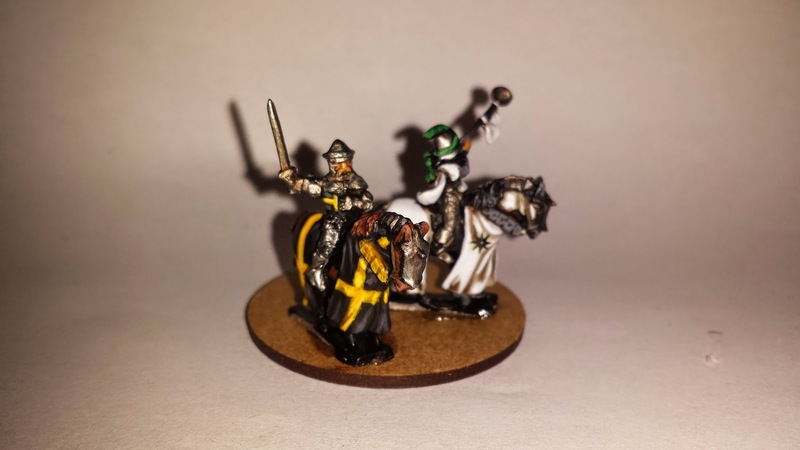 My brother and I had a conversation over Christmas on possible scales and were debating the relative merits of 10mm vs 15mm, well me being an impetus bugger went ahead and ordered up some 15mm figures to see how they painted up. 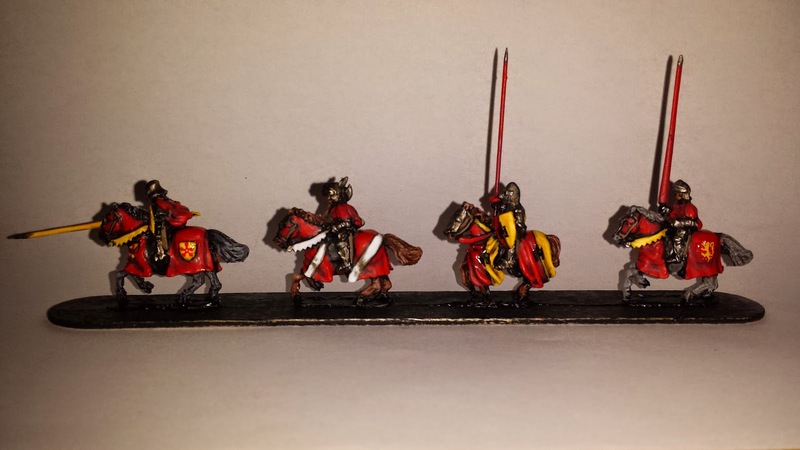 First up we have 8 English knights, with the colour schemes I wanted the myriad of colours that heraldic knights come in but I also wanted something to identify the forces on the table so with the English I went with at least half the unit in a red colour scheme with a couple of others thrown in. The French will be the same but in blue so you should be able to easily identify the two sides when the forces once a game breaks down into melee. I tried something new this time and based the miniatures on large lolly sticks for painting and rebased them afterwards. This did allow me more freedom and access to the miniatures and made painting the heraldry much easier. I'll admit there the fine detail is all decals from Veni Vedi Vici, A coat of matt varnish should hide them well once I've finished basing them. 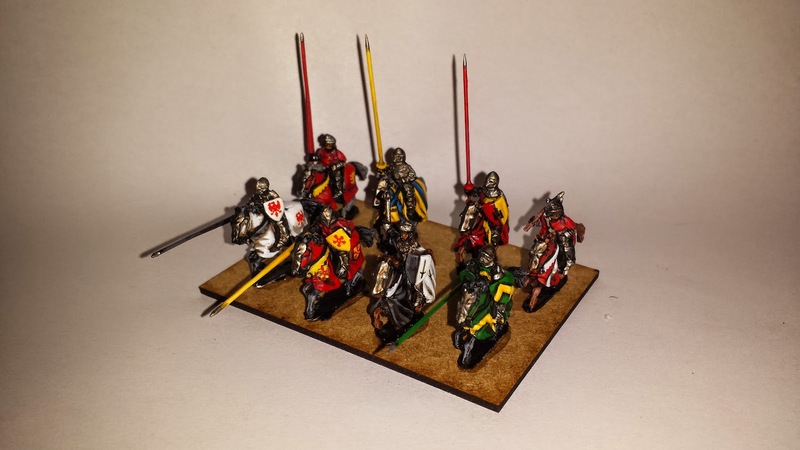 The knights are based on 8cm x 6cm bases mainly for impetus or sword and spear rules, possibly homebrew ones. 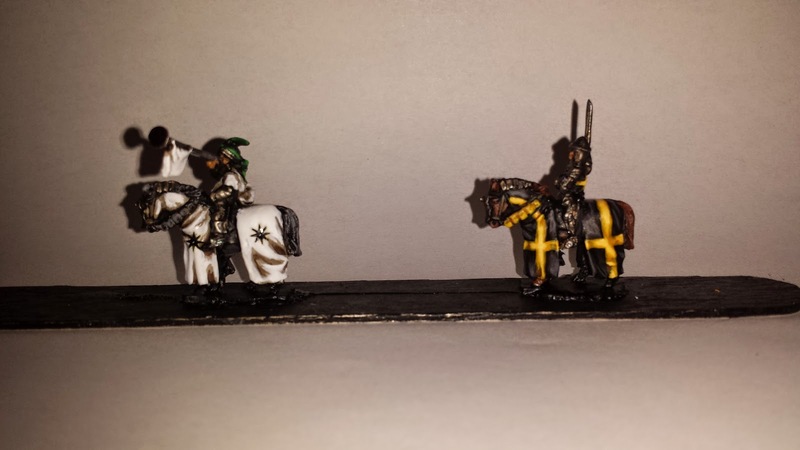 The command stand here represents Robert Ufford 1st Earl of Suffolk, unfortunately I mis-ordered and added a musician instead of another knight to wave his banner, so I have left a little room at the rear of his base to add a 3rd infantryman to this base so I can get a pretty banner on it. All in all I was pleasantly surprised at the speed and ease these painted up, about 7-8 hours work in total and the scale means that the heraldry is fairly easy to paint up without it having to be massively accurate. 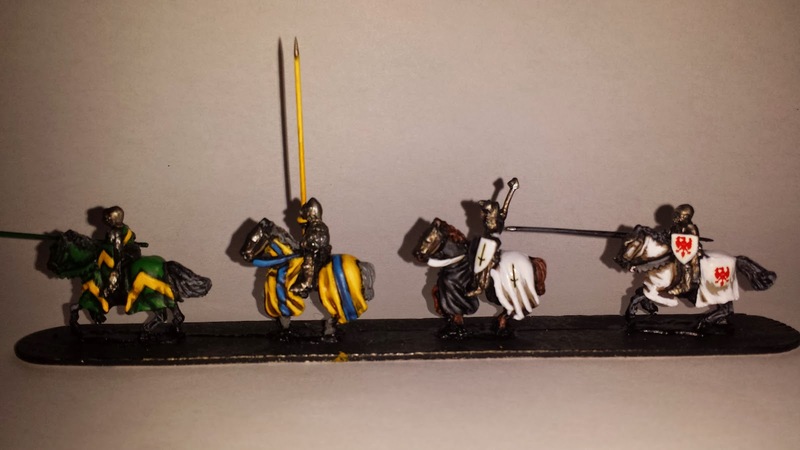 The miniatures are from Donnington's New Era range and are fairly good, I just grabbed a mix of knights and horses with little attention to their actual armour or armament. I've ordered some archers for the next unit as you can't field an English force without lots and lots of longbowmen, it just wouldn't be right. Alright, these are pretty damn nice. Colours realy pop without looking cartoony. Love the look of these, especially the attention to detail on the shields.